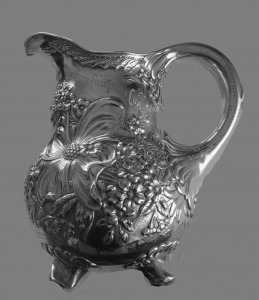 The Expert Challenge Cup (in recent decades known as the Expert Trophy) is an ornate sterling-silver pitcher, 8-1/2 inches tall, that Julian M. Rumsey donated in 1892 to what was then called the Geneva Lake Yacht Club. (Julian M. was the son of Julian S. Rumsey who owned Nettie, the first Sheridan Prize winner.) Rumsey named the trophy after his sloop Expert, winner of the Sheridan Prize in 1890, and he designated it for challenge racing between cat-rigged sandbaggers in the 18- to 21-foot class. 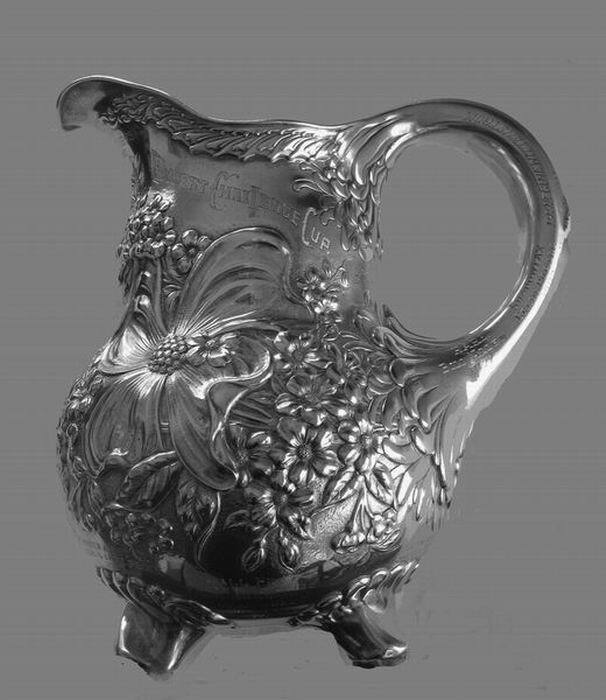 Decoration on the silver pitcher includes a faint swallowtail burgee on the handle (perhaps a private signal) and a heavily embossed design (a dogwood blossom, leaves, other flowers) that twines beneath the trophy’s name and those of its first three winners. Engraved on every surface, even the bottom, are the names of winning skippers up to the 1990s. Currently missing is a new wooden base that bore the names of the most recent winners. Starting in 2012, the winner of the Expert Challenge Cup received for one year a plaque with a drawing of Nettie at the top by the late Ted Brennan and the names of the winners since 1996. On August 27, 1892, John Johnston Jr. won the first of the match races for the Expert Challenge Cup; on September 25, challenger C. F. K. Billings won the trophy; in 1897, Byron Boyden finished first with Walter Jewell at the helm. Within a few years time, Boyden transferred his boat and her equipment (and the trophy) to L. H. Stafford, and competition for the Expert Challenge Cup stopped for close to three decades. Records suggest that the trophy’s return to the Yacht Club in 1927 was facilitated by the efforts of Walter Jewell, Henry H. Porter, and convincing correspondence from Commodore William Nelson Pelouze, Colonel of the First Infantry, Illinois Reserve Militia. In an effort to restore challenge racing “to the high place it occupied when such historic yachts as Nettie, Vanadis, Whisper, Sphinx, and others competed for the championship of the lake,” LGYC’s officers revised the procedures for challenge racing and selected the relatively new Class E to compete for the trophy. The first match in Class E was in 1927, and the winner was Herb Taylor, a former Olympic swimmer and later the instructor of the Yacht Club’s fledgling Sailing School. In April of 1929, club officers abolished the challenge-cup system and designated the Expert Challenge Cup for fleet competition, as is the case today. 1929 O. P. Curran Jr.
1940 Clarence W. Sills Jr.
1946 Clarence W. Sills Jr.
1947 George H. Kiefer Jr.
1949 George H. Kiefer Jr.
1950 George H. Kiefer Jr.